Around 300 UK and international trade unionists have signed a statement condemning recent attacks by the Egyptian military on democratic freedoms. Signatories to the statement include PCS union general secretary Mark Serwotka, teachers’ union leader Christine Blower, and Labour MPs John McDonnell and Katy Clark. We note with grave concern recent developments in Egypt including the decision on 14 June 2012 by the Higher Constitutional Court to dissolve parliament and allow the candidate of the old regime, Ahmad Shafiq, to contest the presidential election. The court decision followed the announcement of a law on 13 June 2012 giving military intelligence and police permission to arrest civilians on suspicion of “crimes and misdemeanours harmful to the government,” “resisting orders issued by those in power or assaulting them,” “destruction of public property or historic monuments,” “obstructing traffic,” “strikes at institutions that serve the public interest or assaulting the right to work,” and “intimidation and thuggery.” Then on 17 June the Supreme Council of Armed Forces issued another decree that grants Scaf powers to initiate legislation, control the budget, appoint a panel to draft the new constitution and postponing elections until a new constitution is approved. This is a military coup designed to wipe out all the gains of the last 18 months. We condemn the assault on democratic freedoms that these decisions represent and declare our support for all Egyptians who are resisting this attempt by the military to restore the old regime. 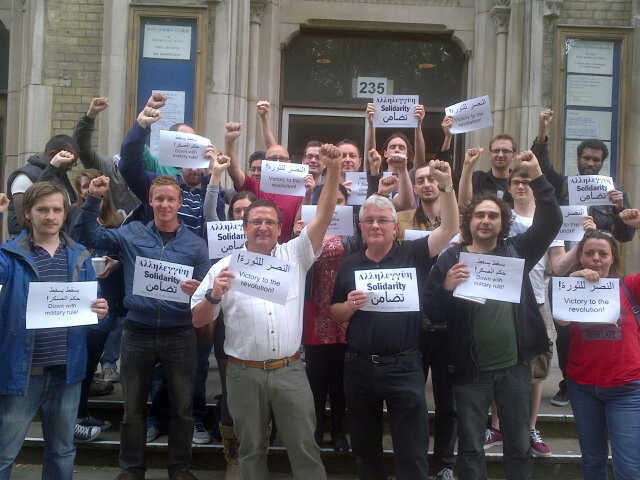 We also affirm our continued solidarity with the struggle for social justice in Egypt, and in particular with the ongoing efforts to build an independent workers’ movement which can lead the fight for ‘bread, freedom and social justice’. The unity between the social and democratic goals of the revolution which is expressed in this slogan is an inspiration to millions around the world who want to resist the rule of the 1%.